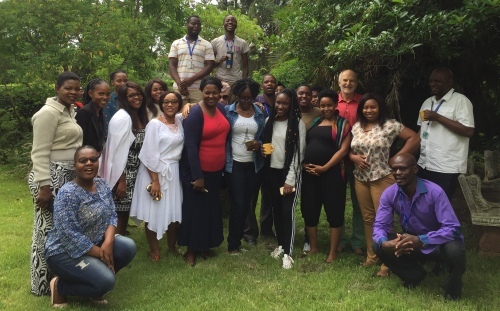 SEARCWL welcomed a new group of 25 Masters students in February 2019 who are busy in their first semester as work piles up. They are pictured above at the centre with Prof Aslak Syse who came from Norway to speak to them about Disabilities focusing on the Convention on the rights of persons with disabilities (CRPD) and its optional protocol. The students are coming from various backgrounds and among them are legal practitioners, police and prison officers, intelligence officers as well as Gender programme and advocacy officers. There is an Arts and Theatre director from Malawi and a Managing director from Zimbabwe among them. It is thanks to the generous funding from the Ministry of Foreign affairs Norway that the programme continues to run again this cycle. As seen above, the programme attracts male participants who are always welcome. There are five male students in the class. We also have a baby on the way to be delivered during the course of study and the mother will continue with her studies. SEARCWL will make the mother as comfortable as she can be in order to proceed. The group will be taking their first semester field research to Chinhoyi, a town 115km from Harare. Students will be looking at various topics such as Women and Girls health rights, Violence against women and girls, maternal mortality, Marriage and child marriage and Women and economic issues narrowing down to the informal sector. Rich grounded research output is expected from this exercise and students will go there with gender lenses enhanced by exposure to disabilities, roles of religion and culture, sexuality and masculinities over and above the first semester courses which are Research Methodologies and methods, Theories and Perspectives in Women's Law and Human Rights concepts and issues. Student reports with recommendations will be made available to relevant authorities and copies will be made available at the centre and possibly on the website. On another note: Mr Johnson Chingozho left SEARCWL for further studies at the end of February 2019. We all wish him well. He had been with SEARCWL for 15 years. He took the time to upgrade himself academically and is excelling.